Not every training always goes exactly to plan for the trainer. Sometimes we get the feeling that something basic is off and that we should change something. You want your participants, employers and yourself to be truly happy with the trainings you give on a daily basis? Trainings can become substantially better through a short, compact and efficient coaching tailored precisely to you and your previous training experience. Basically, you can imagine the training to be just like a didactic coaching – only better! This is because the Trainingsdesign Coaching not only transmits the “how“ but also the design of trainings. 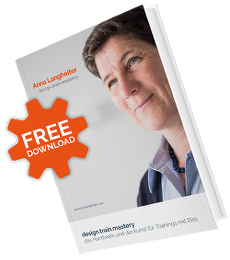 For the Trainingsdesign Coaching you bring your training and together we assess what the changes could be. By the end you not only have a finished design but many, many new ideas for the realisation of your next trainings. Simply bring your training contents to the coaching. Based on your questions we either conduct a training needs analysis or directly jump into the creative re-design to ensure that the content can be passed on succinctly. At the same time you receive inspiration as to how the designed training can be realised well. Who is the target group for Trainingsdesign Coaching? Is missing pep and interaction in their trainings. Wants to train given trainings and realises that there is no productive outcome. Wants to ensure that their trainings are exciting and have a red thread all the way through. Has good content but not received good feedback or recommendations. Needs interaction exercises, practices and simulations that fit well with their content. Does not yet know how to transfer their knowledge.